This darling new white cotton blend baby and toddler hat is made by Will'beth, a leading designer of beautifully detailed baby clothing. Made in classic beret style, it is elasticized in the back to ensure a good fit. Perfect for your little sailor! What an adorable little christening cap or hat for your little one to wear for any special occasion! Note: This hat runs small. You may wish to order a size larger than usual. Size 3 months inside band circumference with elastic unstretched=15"
Size 6 months inside band circumference with elastic unstretched=16"
Size 9 months inside band circumference with elastic unstretched=16½"
Size 12 months inside band circumference with elastic unstretched=17"
Size 18 months inside band circumference with elastic unstretched=18"
Size 24 months inside band circumference with elastic unstretched=19"
Size 2T months inside band circumference with elastic unstretched=20"
Size 3T months inside band circumference with elastic unstretched=21"
Size 4T months inside band circumference with elastic unstretched=22"
Grammie's Attic has the largest collection of infant and toddler sailor suits and sailor dresses you'll find. 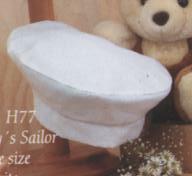 Be sure to see all our sweet baby sailor suits!, toddler sailor suits, baby sailor dresses, toddler sailor dresses, little girl sailor dresses, baby sailor hats, toddler sailor hats, and children's sailor hats.